Relax along the banks of Fly Creek at a historic, water-powered cider mill that has attracted travelers for over 150 years. See how cider is made and tour the marketplace to sample more than 40 local specialty foods, including Mill-aged cheddar cheese, house-made fudge, salad dressing, salsa and hot sauce, fruit preserves, hard ciders, and apple wine. Admire an impressive collection of vintage John Deere tractors on display and at work. Let the kids pet the chickens and play on the Tractorland playground. Feed ducks and geese from the Millpond boardwalk and enjoy a leisurely lunch with a glass of cider. 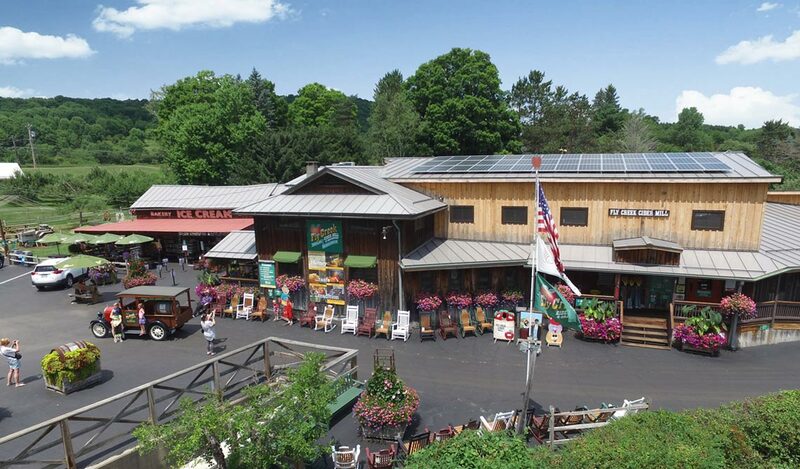 Grab a snack from the bakery to go and a case of cider for a sweet souvenir of Fly Creek Cider Mill in Cooperstown, NY. How do I get to Fly Creek Cider Mill & Orchard? Fly Creek Cider Mill is located three miles from Main Street Cooperstown, just off County Route 26 at 288 Goose Street, Fly Creek, New York. The Mill is just north of Fly Creek's center. What type of food is served at Fly Creek Cider Mill's restaurant? The Snack Barn Restaurant & Bakery offers a varied menu with hot dogs, sandwiches, sweet Italian sausage, soups in bread bowls, chili, nachos, BBQ pork, and pot roast. Pies, dumplings, and cookies are baked fresh on-site. You'll also find cider slushies and floats for kids, plus draft hard ciders, wines, and local beers for adults.